What is Outlook Rules Facility? Rules reduce the effort of carrying out the same action when similar type of email arrives, by managing them in separate folders. Rules automate the task of email management. When a message is received from a specific user with the help of rule, Outlook will transfer it to the specified folder. If user wants to keep their marketing department mails in single folder, then email will be transferred to the same folder. If user wants to manage all its emails by a specific subject line then also with the help of rules one can manage it in a separate folder. 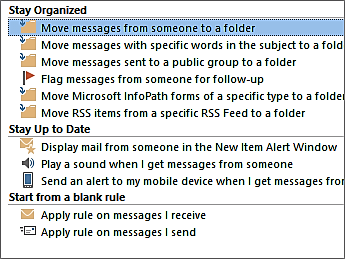 Stay Organized: This rule helps user in taking follow up, moving messages from a particular user into a specific folder and moves the emails with specific words in subject line to a separate folder. Stay Up to Date: By applying this type of rule, users will be notified in some way when they receive any particular email. It will automatically send the alert message to mobile phones when user will receive message from a particular user. Start from Blank Rule: User can easily customize this type of rule accordingly without any rule template. How to Create Outlook Rules to Manage Emails? Go to the Manage Rules & Alerts. In the Rules and Alerts box, click on the E-mail Rules. Now click on New Rule. Edit the rule description, by clicking the underlined value. Now Select Conditions that user wants to the messages to meet for the rule to apply. Select Actions users can select the action that they want the rule will take when the specified conditions are met. User can edit the rule description, by clicking an underlined value for any action that you added, and then specify the value. Select Exception, select any exceptions to the rule, and then click Next. Now specify the name for the rule. Setup rule options, users can select the check boxes for the options they want. If user wants to run the rule on messages that are already present in the Inbox, then select the “Inbox" check box. To apply the rule to all email accounts in Outlook, select the “all accounts” check box. By using, the above-mentioned steps one can manage Outlook email messages by using Microsoft Outlook rules facility. By using the above-mentioned options, one can easily sort their emails in order to make them more manageable. Users can increase the manageability of their inbox with the help of rules and can quickly search the desired email from a humongous collection of emails. It is a very complicated task to manage emails of MS Outlook when there are thousands of messages piling up in your Inbox. With the increased number of emails, it becomes a complex task to manage emails and it causes problem in searching the desired emails quickly. In order to tackle such problem Outlook gives the rules facility to managing all emails in categorized folders. In this article, we will discuss Outlook rules and different ways to manage emails by using the rule facility.